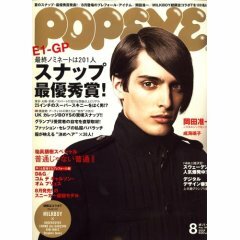 First published in 1976, POPEYE is kind of a fashion catalogue for young urban men, especially high-school and university students. About a fourth of its readers are 16-17 years old. But not all readers are students, some 18% actually have an annual income of over JPY 5 million (Convert). POPEYE’s enormous early success led to the publication of Hot-Dog Press (1979), Brutus (1980) and Olive (1982). One big happy family. Like many magazines, Popeye was hurt badly in the late 90s and saw its circulation nosedive. Published by Magazine House, it has a circulation of 71,000. Magazine House is huge and also publishes an•an, Tarzan, Brutus, Croissant, Hanako WEST, ku:nel and many other well-known Japanese magazines.